The Oceanic Systems 3345 Colour MultiFunction Display, provides a compact and flexible solution to display all the ships Tanks, DC Sources and AC Sources on a single sunlight readable bright colour display. 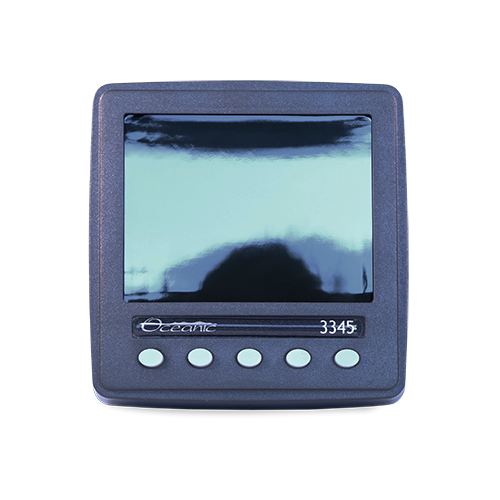 The 3345 is simply connected to the NMEA2000® network with a single cable. All of the NMEA2000® tank senders, battery monitors and AC source monitors will display their information on the multi-page display. It has a high-resolution sunlight readable colour display in a compact 95mm square rugged format. No need to have larger cumbersome separate displays for all these functions anymore. The display screens are user selectable so that the user can mix the tank sender display to suit their requirements, allowing them to choose different tank types on each page, of a multipage tank display. Each Tank Sender, DC Source Monitor and AC Source Monitor can have a user selectable descriptive name to make identification easier. Each Tank Display will show tank level and tank VOLUME where this information is available (i.e. From Oceanic Systems Tank Senders). It is certified to the NMEA2000® network standard and draws just 200mA current from the network. It comes with a detailed User Manual that identifies what NMEA2000® data can be displayed and how to select that data. The 3345 is simple, powerful, reliable and very easy to install and use.